I’d never actually made my own meatballs before, but then I saw this recipe on Money Saving Mom and decided that it looked easy enough to try. I love that I can cook them in my slow cooker and not have to worry about them until it’s time to serve dinner. You will want to make sure that your meatballs are cooked through before serving. If they’re still pink in the middle you can either let them cook longer in the slow cooker or cook them for a minute or two in the microwave. 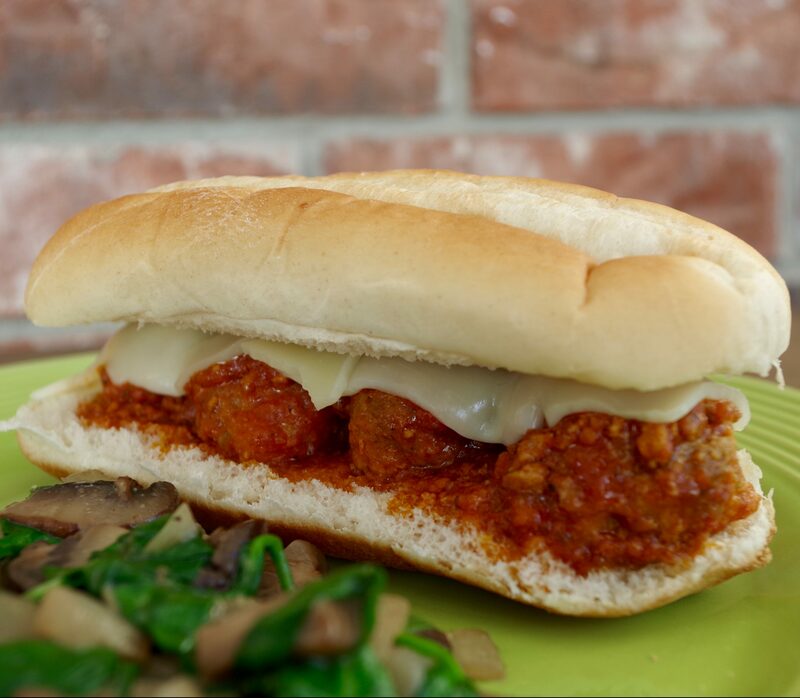 These Slow Cooker Meatball Sandwiches made a delicious and easy meal that my family loved! I hope you enjoy them! Step 1: In medium bowl, mix beef, breadcrumbs, cheese and eggs. Step 2: With hands, make mixture into medium sized meatballs and place in slow cooker. Step 3: Pour pasta sauce over meatballs and cook on high 4-6 hours or on low 8-10 hours until meat is cooked through. Step 4: Cut one meatball in half before serving to make sure no pink remains in the middle. Step 5: Spoon 4 meatballs over hoagie bun and top with sliced mozzarella cheese. In medium bowl, mix beef, breadcrumbs, cheese and eggs. With hands, make mixture into medium sized meatballs and place in slow cooker. Pour pasta sauce over meatballs and cook on high 4-6 hours or on low 8-10 hours until meat is cooked through. Cut one meatball in half before serving to make sure no pink remains in the middle. Spoon 4 meatballs over hoagie bun and top with sliced mozzarella cheese.